It was inspired by the striking Arts & Crafts house it belongs to. The arched top of the gate appears frequently throughout the building’s architecture. The adjoining garden needed some sort of entrance/frame/pointer so it was a natural choice to include it in the design. The in-fill was an open brief so I used a few signature shapes and scrolls, bearing in mind all the time the Arts & Crafts style. I left the middle of the gate fairly open to allow a clear view through and to frame the garden vista. The gate is mounted on a pair of solid 40mm square posts. The ironwork was hot zinc sprayed to provide cathodic protection and the finished in a conventional manner. 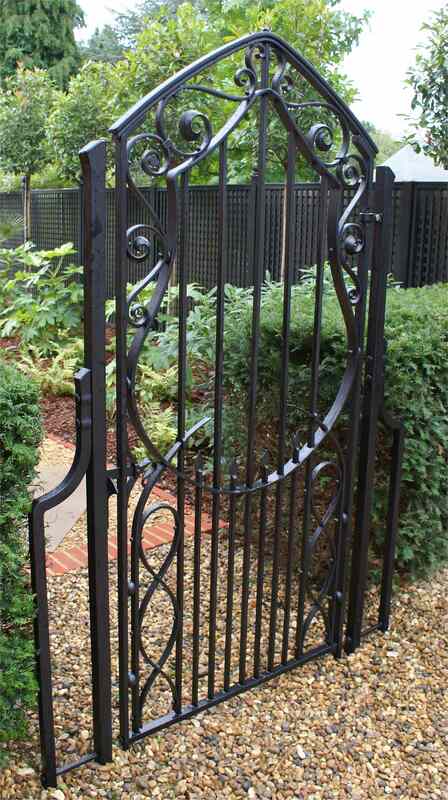 The last coat of paint applied was graphite loaded, so the ironwork could be polished to add a graphite patina lustre.